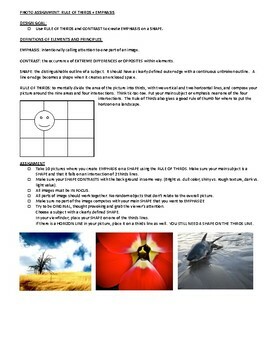 A one page handout to encourage students to explore RULE of THIRDS using photography. This assignment can be done with a phone, tablet, or camera. Digital photography is a great way to generate primary sources in drawing classes as well. I have used this assignment in both AP 2D Design and my Advanced and AP Drawing classes to encourage experimentation with COMPOSITION and help students go beyond centering/symmetry. One page with directions and examples.